Happy Monday and I hope you all had a good weekend. I have been busy with some creative writing for a client, so I know this post is a little overdue. But here it is now. On Wednesday morning, we had to get up at the crack of dawn because we were on a mission: getting a taste of the Scottish Highlands. Literally. I packed us some snacks and drinks the night before and after our morning coffee, we were ready to roll. We left our cozy apartment behind and headed towards the Royal Mile in the heart of Edinburgh, from where we should leave with several other people with Highland Explorer Tours who are also commissioning this post with a discount (with opinions certainly being my own). A little after 8 am, we began our day trip. If you try to squeeze in a taste of the highlands into one day, you naturally have to prepare for quite some driving. The ride was relaxed and our guide, who also drove the bus, was playing Scottish music while providing us with some great facts about this beautiful country. Did you know Scotland was formed by two tectonic plates? We also heard about Shinty, a Scottish Highlands game played with a ball and simple sticks. Sort of comparable to hockey with a number of differences, though. We also learned about the Kelpies, two large horse head sculptures made of steel that we saw in Falkirk. According to the saga, those ghost like creatures are living in Scottish waters and appear in the form of horses. Oh, the Scots and their tales. It's amazing how deep-rooted history and myths are in this country - and I am a huge fan of it. We soon entered one of Scotland's two national parks: Loch Lomond and The Trossachs. 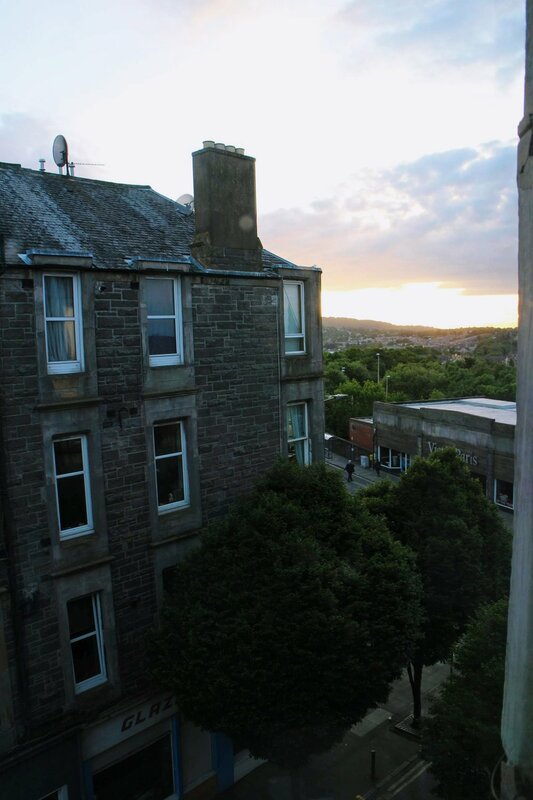 Thus, Edinburgh was left behind quickly and we were surrounded by a lot of green. I marveled at the changing scenery that also included a number of sheep - naturally?! It's amazing how lush green it is here but, then again, this probably does not come as a surprise considering the fact that it seems to be raining at least once daily. 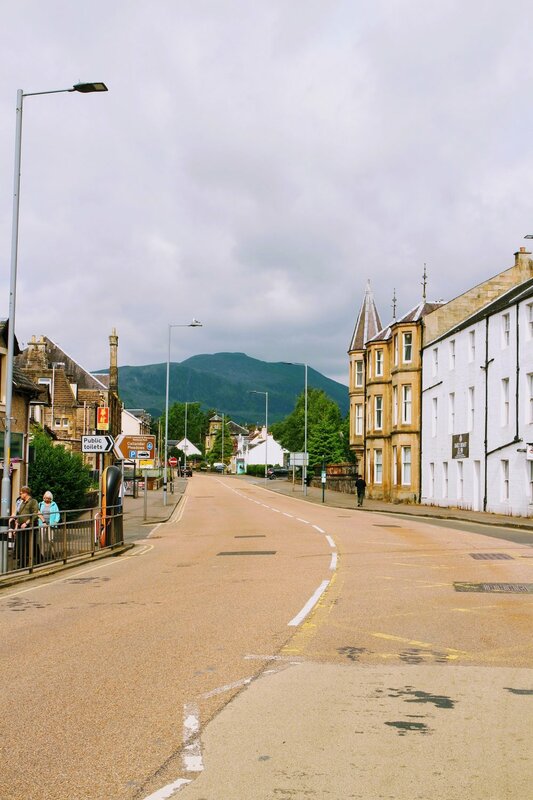 Our first stop was Callander - gateway to the highlands. A little sleepy village that sees an increase in retirees. Hence, it has the oldest population in Scotland (no wonder it's so quiet). 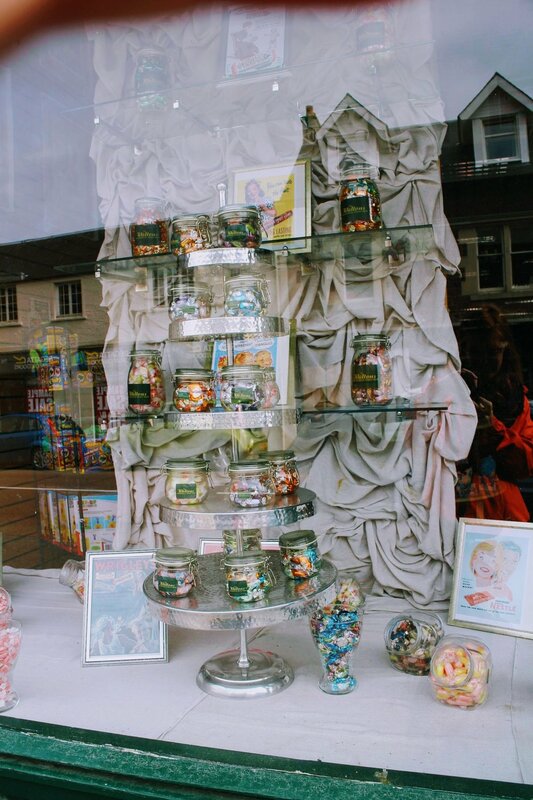 Also, it is home to a famous bakery. You won't miss it. We stopped here for about thirty minutes and wandered up and down the street, gazing at the cute cottages and traditional buildings. I was excited to see more. 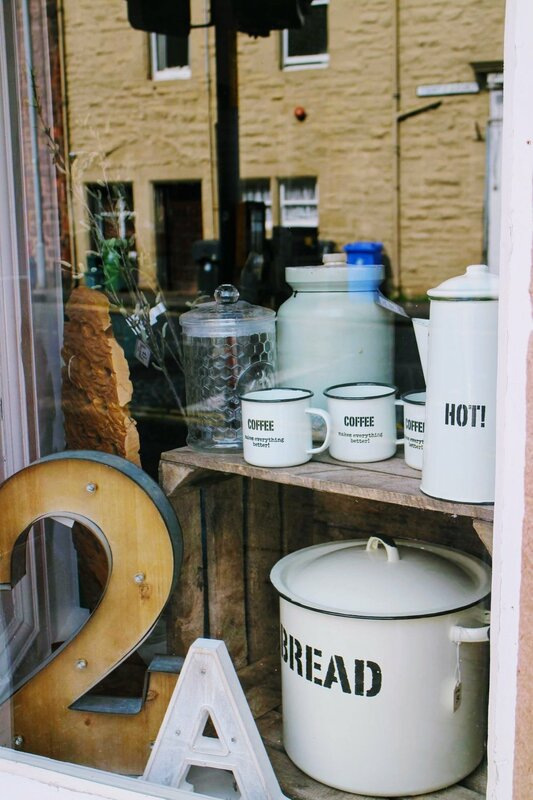 Scotland gives me all the cozy feels. Back on the bus, we embarked on the second stretch of the day, maybe another roughly 2 hours. I couldn't help but aww at the lush green landscape that looked so utterly untouched. No houses. Just green. Green. And mountains. Rough terrain, and winding paths. I was trying to imagine how it might have been ages ago, when the highlands were home to many clans and their bloody fights. What a rough place to live. We then stopped in Glencoe. My word, what a beautiful place on earth. It is so dreamy and romantic. Undoubtedly, this town and its surrounding area make for the perfect getaway - into nature, completely unplugged. Life at its purest. 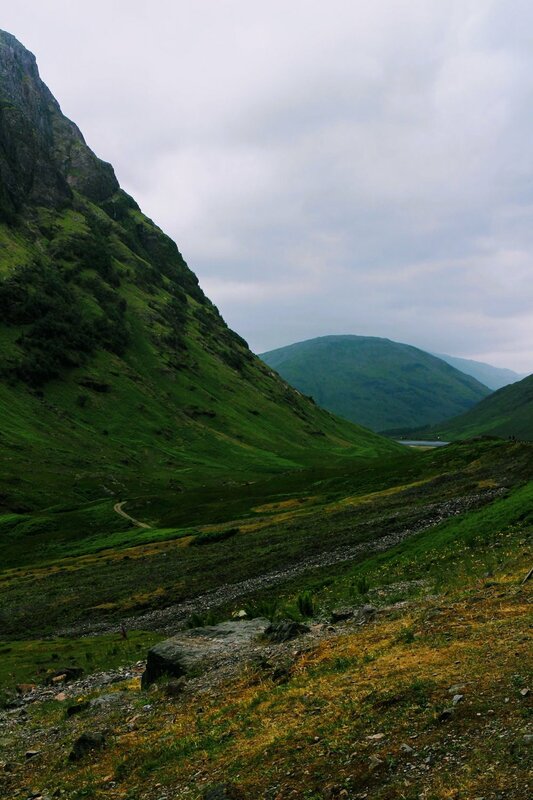 I encourage you to google Glencoe, and you'll get a real desire to experience this place yourself. I wish we'd had more time to actually stay there. Along the way, we also had a quick stop at the so-called Three Sisters, an impressive mountain range. 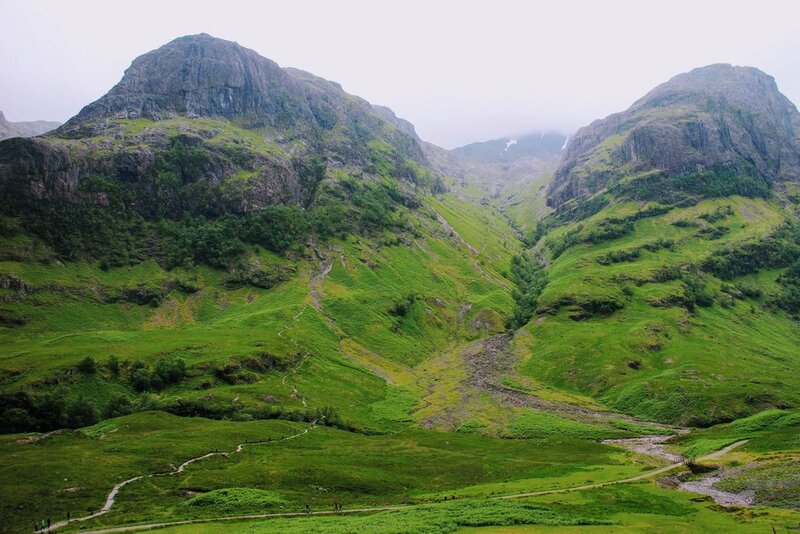 The actual name is Bidean nam Bian. It is one of the most scenic places in the highlands. Scotland has been voted the most beautiful country in the world. Can you get a glimpse of why that is? Ever since I learned about the 96-mile West Highland Way, a pretty long hike but apparently life-changing, I have been intrigued to make this happen. Well, first: baby. Then: getting my fitness level back. Once that: All the adventures (with a kid? Possible.). But for real: This route is said to take you along infamous lochs, stunning parks, and up great mountains, and through mystical moorlands. Do your research on it if you're looking for a new outdoors challenge. It might just be what you were looking for. We passed by the highest point of Scotland: Ben Nevis Mountain Range. Due to the weather conditions, only about 50 days out of the year can you see the summit. Nearby Fort Williams is said to be the outdoors sports capital of the UK. 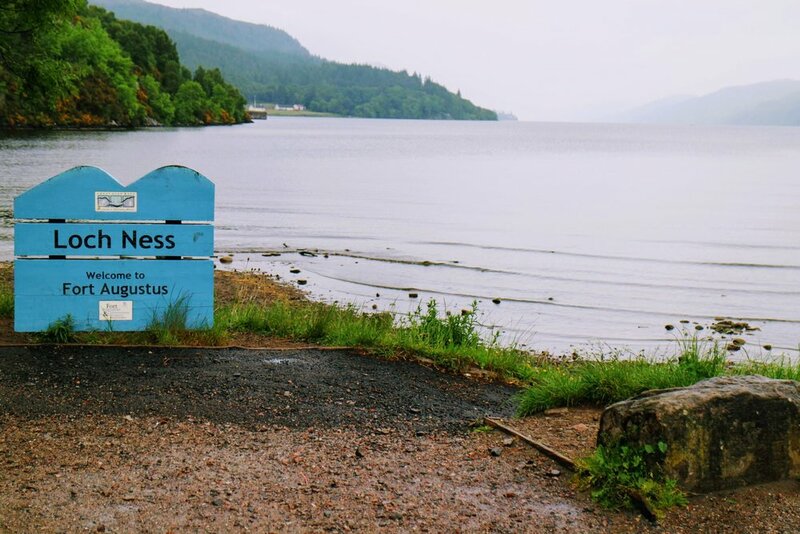 After almost 6 hours on the road - with various stops -, we finally reached our destination: Fort Agustus, the town by the famous Loch Ness (anyone not heard of Nessie, the (friendly) monster?). With 23 miles long and one mile deep, Loch Ness contains the most water of any lochs in Scotland. And of course, it's famous for one myth: Nessie (Nessi? Nessy?). The saga about this beastly creature living in this loch initially took roots in 565 AD when it was apparently spotted for the very first time. 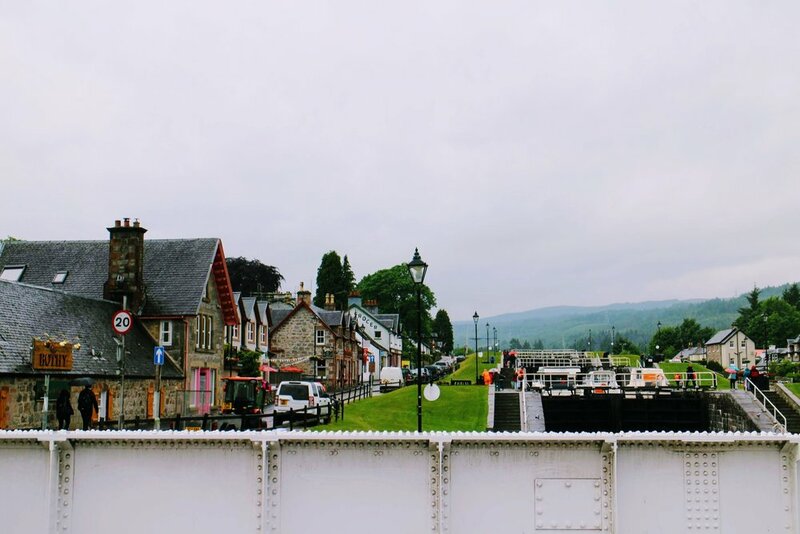 Fort Augustus is a charming town but boy, there were more tourists than I thought there would be. Also, it was raining cats and dogs. 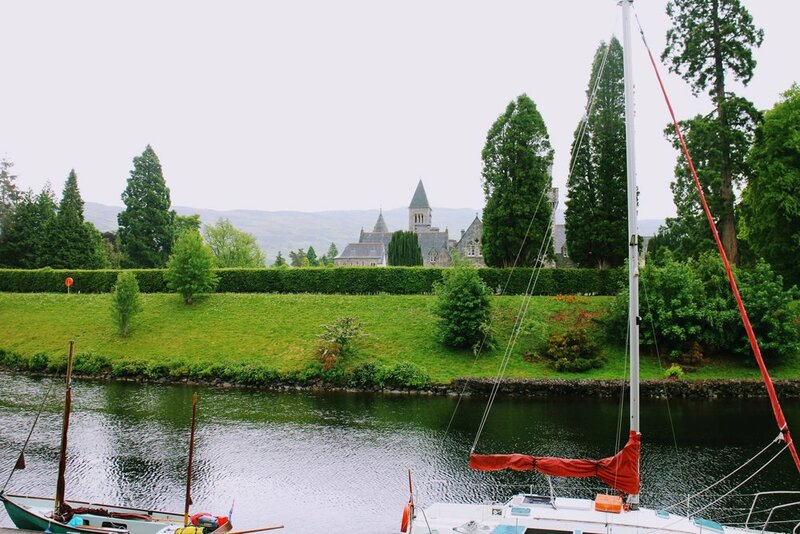 We had booked a boat tour on Loch Ness in advance. However, since we only had less than an hour and a half there, were hungry, and needed to rush if we wanted to catch the boat, we decided to ditch the boat ride and, instead, stroll around a find a pub to get some lunch. This turned out to be the more relaxed option. However, time just went by so fast that we realized upon paying our bill that we only had 15 minutes left before the bus should depart. This is when we were a little disappointed that everything was so strictly timed. But on the other hand, I completely get it because if you want to see as much as possible in one day, you gotta be prepared for some driving and a schedule. We headed over to the Loch Ness lookout and stood there for a minute, taking in the view over the misty loch, as it was only drizzling now. Scottish weather at its finest. But as I always say: It just adds to the atmosphere and, somehow, the gray weather is part of Scotland. There's just something mystic about it. We hopped on the bus and embarked on the ride back. 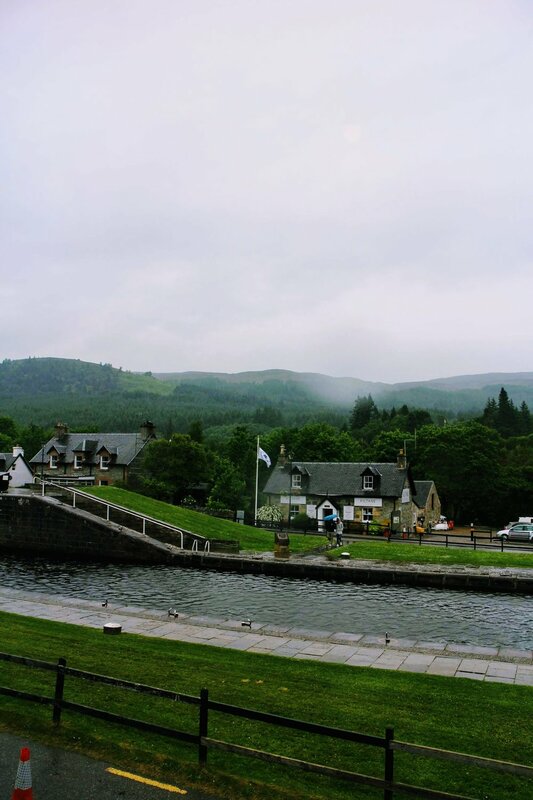 We stopped at charming Pitlochry know for its Festival Theater, and then drove through a few other villages. As the route was different, the scenery changed from mountains to a more vast, open land at times. 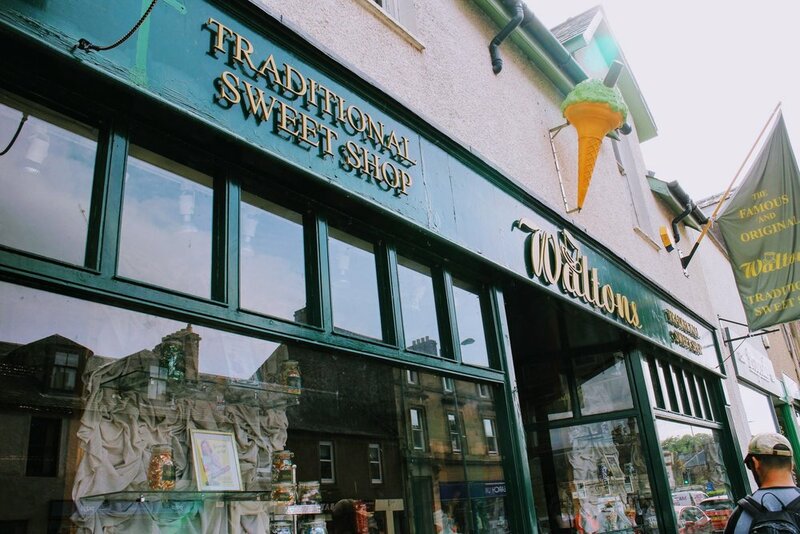 We heard more tales about Scotland, its land and people, whisky as national beverage, and so much more. Since our guide was such a good storyteller, this might as well have been one of my favorite parts of the trip. We reached Edinburgh around 8 pm that night and were tired. Even though it was a lot of sitting on the bus, we got a feel for what the highlands look like. This taste definitely made us want to come back for more. 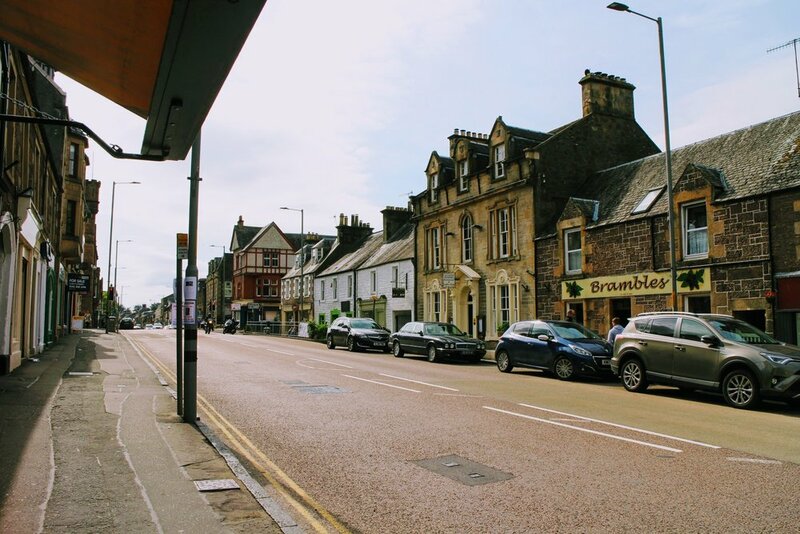 Next time, we will rent a car and go on our own terms, from little town to town, to immerse ourselves in this oh so enchanting spirit of the impressive Scottish Highlands and its wonderfully authentic villages. It was a long day with so many new impressions on this Loch Ness Explorer Tour - which we loved, on the one hand. As mentioned before, however: Be prepared for a lot of driving and a tight schedule (so no time to explore on your own) because after all, you're trying to squeeze in a lot in one day. 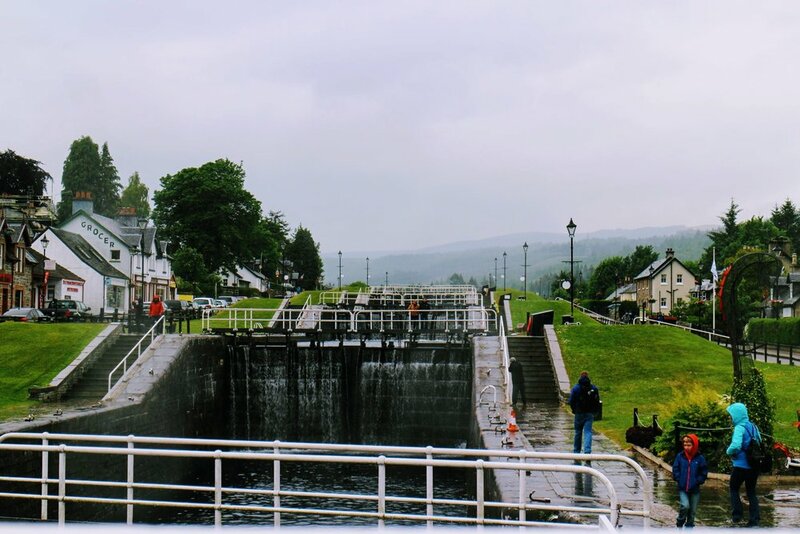 It is, however, a great tour for someone who is keen on getting a very first taste of and feel for the breathtakingly beautiful Scottish Highlands. It only made Rickey and I realize that we definitely need to come back and explore more. This place is simply too enchanting to just pass through. Are you tagging along on, Instagram, and Twitter yet?